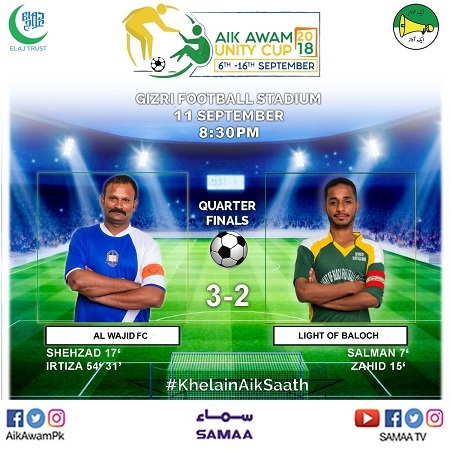 The quarterfinal stage of the inaugural Aik Awam Unity Cup was played on Tuesday at Karachi’s Gizri Football Stadium. National Fighter, Young Baloch, Gizri Star and Al Wajid FC won their elimination matches. 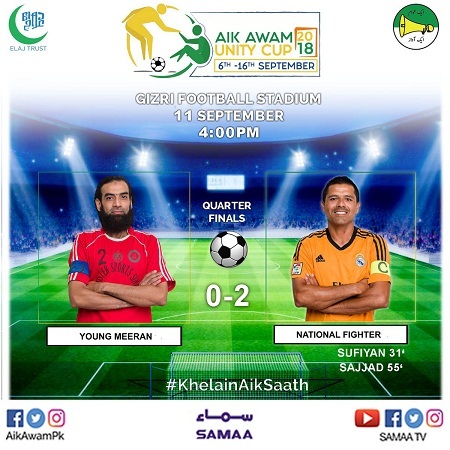 National Fighter picked up a 2-0 victory over Young Meeran in the first quarterfinal. Sufiyan scored a goal in the 31st minute while Sajjad confirmed his side’s place in the semifinal by scoring in the 55th minute. Home team Tanzeem Sports was eliminated by Young Baloch on a penalty shootout in the second fixture of the day. The two sides did not manage to score a single score in the 70 minutes of the game. The Baloch side held their nerve and won by 4-2 on penalties. The quarterfinal between Gizri Star and Lyari Brothers was also decided on penalties. Ibraheem put Lyari ahead in the 21st minute but Raza equaled the score line for Gizri after seven minutes. Zaid and Ismaeel of Lyari were shown red cards in the match. The contest could not be decided in the 70 minutes and it went to penalties. It was Gizri Star who managed to win the match 5-4. 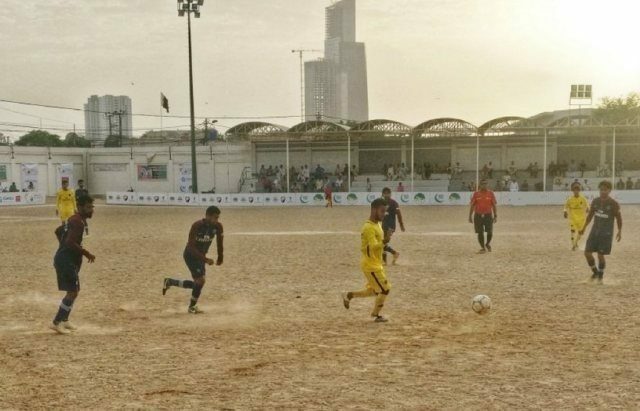 Al Wajid FC made a comeback to beat Light of Baloch 3-2 in the fourth and final quarterfinal. Light of Baloch went ahead as Salman scored in the seventh minute of the match. Zahid scored their second goal in the 15th minute. Shehzad pulled one goal back for Al Wajid in the 17th minutes. 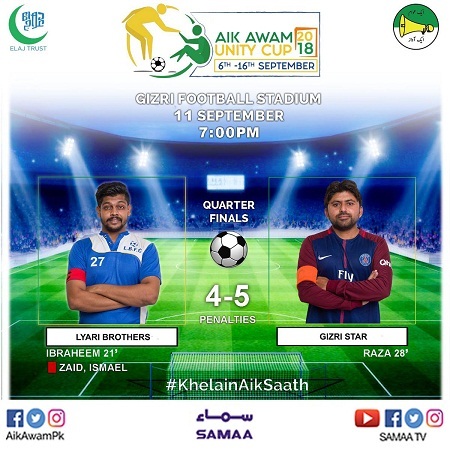 Two consecutive goals by Irtiza helped the side in securing their spot in the semifinal stage. 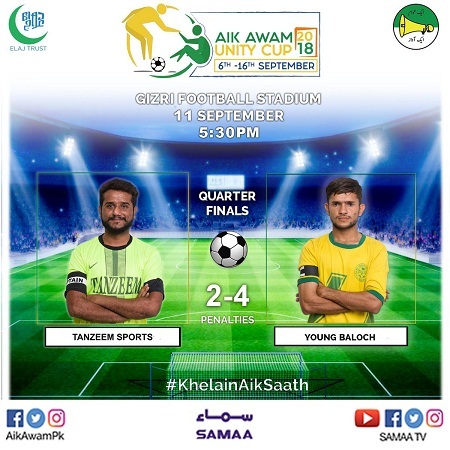 Al Wajid will play against National Fighter while Gizri Star will take on Young Baloch in the semifinals, which will be played at KMC Stadium on September 14.